We have been busy with our excavations at Fort Hunter and have enjoyed some incredibly good weather. The interest from the local community is terrific with close to 3,000 visitors last Sunday during Fort Hunter Day. Our daily visitors at the site include school groups and home school students who want to see archaeologists at work. We hosted Commonwealth Connections Academy this week as well as two large groups of home school students. All of our visitors are enthusiastic and engaged in our excavations and we appreciate their enthusiasm. If you haven’t had an opportunity to stop by the site, we close our excavation next week on October 2nd, 2015. · The Milk-house was built in the north-east side of a slope, near the well and not far from the mansion. It was composed a stout stone walls, and the roof, which rose 6 or 3 feet above the surface of the ground, appeared to be covered with earth or tile, and was deeply shrouded with the scarlet trumpet creeper (Bignonia radicans), then in splendid bloom. The interior of the house, principally under ground, was fitted up with cistern, in which water stood nearly to the tops of the pans of milk, which were arranged in them. The house was entered by a flight of steps on the south, and there was a window on the north, which could be opened or darkened at pleasure, to give ventilation. For want of a natural spring, which many Pennsylvanians consider almost indispensable in a milk house, the water was conducted in a pipe from the well-pump, and after filling the cisterns to a certain height, passed off at the opposite side. The object was to obtain a cool temperature, in the heat of summer, which greatly facilitates the separation of the cream from the milk, and this object was amply effected, with the labor of working occasionally at the well-pump. 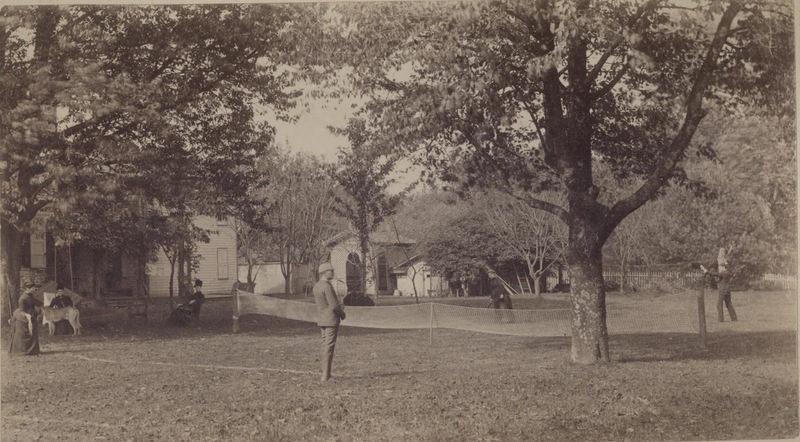 While difficult to see in early photos of the property, there does appear to be vegetation overhanging the side of this structure in the above photo. Later images of dogs from this area of the yard also show signs of a large plant which we are surmising is the trumpet vine referred to in the article. This week the interior was cleared of the floor boards and the artifacts recovered were a mixed assortment of late 19th and 20th century materials. The exposed brick floor has been swept and additional measurements of the structure were taken yesterday. Visitors this week included our architects and architectural historians from the PHMC who examined the structure and support our designation of the structure as a milk-house. Our interns this semester will be working on a detailed drawing of the structure and we will continue to research photos and documents before definitively stating that this is its function, but again this seems to be a plausible identification. We are continuing to dig along the east side of the porch, directly in front of the original stone house structure and have recovered several glass trade beads. Historic documents indicate that there were several meetings held at the site with Indians and that trade was occurring in the area. 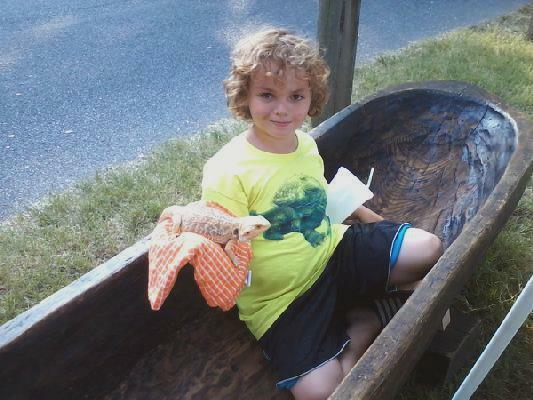 Joseph Chambers and Simon Girty were both licensed to trade in 1747-1748 in Paxtang Township which was the original township for Fort Hunter. Several features have been exposed in this area which we are continuing to investigate and will report those findings in our next blog. The foundation is almost completely exposed of a structure currently identified as a smokehouse. Historic documents reference an octagonal shaped smokehouse on the property in 1828 and the dimensions are relatively close to the description. There is a great deal of work to do in this block as there are multiple features which require careful excavation and mapping to insure that the proper function is assigned. Removing the previously excavated soil to the south and east of our block has provided an opportunity to look at the entire foundation. The diameter of this circular foundation measures just over 13 feet. Certainly additional research will continue on this area, but the image of this foundation is pretty impressive. We hope you’ve enjoyed this update on our investigation at Fort Hunter and will stop out to visit or check back on our blog to see what next week’s excavation might reveal about this historic site. As a reminder- October is Archaeology Month in Pennsylvania http://www.pennsylvaniaarchaeology.com/ArchMonth.htm so please seek out an opportunity to visit a site or to read more about the heritage of your community as provided in the archaeological record. Opening the Fort Hunter Excavation and our Exhibit at the Kipona Festival in Harrisburg. It has been a busy but interesting two weeks for the Section of Archaeology at the State Museum. 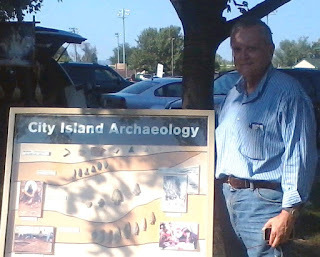 Last Wednesday, September 2nd, we opened up our excavation at Fort Hunter and for Labor Day weekend, we celebrated with an exhibit on the archaeology of City Island at the Kipona festival in Harrisburg. The Section of Archaeology enjoys the break each fall when we return to our Fort Hunter investigation. Normally, we start on the Wednesday after Labor Day each year by bringing up the field equipment, clearing away the vegetation from the previous year and laying out the stakes for the grid. This year the excavation floors were in reasonably good shape and the walls had not suffered too much but the weeds that had grown around the perimeter were pretty impressive. The jewel weed was over six feet tall and the rye grass resisted removal until we dug it out with shovels. One of our new volunteers, Paul Rudnick, cut his hand while pulling the rye grass out from last year’s back-dirt pile. Thursday, September 3rd, we got to work in earnest, straightening walls and troweling floors. We have three main goals this season. One is to investigate the circular feature in the excavation block east of the icehouse. Based on historical research conducted this spring, it appears to be the foundation for an octagon shaped smoke house built by Mr. McAllister in the early 1800’s. Rather than generating smoke inside the structure (a fire hazard), a stove was housed in a small attachment to the octagon. Investigations in this feature should confirm our research and add to our understanding of the McAllister use of the site. Our second goal is to investigate the area immediately in front of the original 1786 McAllister stone house. The folklore surrounding the location of the Fort Hunter blockhouse is that it is now under this structure. Possibly there are fort period features in this area so a five by twenty foot trench was begun adjacent to the porch. Only the upper portion of the “A” horizon has been excavated but there seems to be some kind of concentration of cut stone, ceramics and bone in arranged in a lineal pattern. Concentration of cut stone, ceramics and bone adjacent to the McAllister porch. The third goal and the one that has generated some controversy among the staff, is to investigate the icehouse and determine if it actually functioned to store ice. The staff at Fort Hunter Mansion refer to it as the icehouse and it has two foot thick walls, common for this type of building. However, the dimensions of this building, ten feet wide and fourteen feet long, do not fit some of the historical descriptions. In addition, the historical icehouse had two floors and is described as between 15 and 20 feet deep. These nagging discrepancies were further agitated last season when we exposed a drain-like feature emanating from an opening in the rear of the icehouse wall. This is only two feet below the surface and by all appearances seems to be a drain but not nearly deep enough if the bottom of the icehouse was over 15 feet deep. So for this season, we plan to investigate the drain like feature (Feature 90) and attempt to determine the depth of the icehouse using a bucket auger. Adding to the questionable use of this structure as an icehouse is that early this week while cleaning the floor along the foundation of the west wall, it appeared that we were going below the rock foundation. For several seasons, we have been gradually exposing this foundation wall as we investigated the well and the Late Archaic prehistoric occupations in this area. If this was an icehouse, we assumed the wall would continue down ten or fifteen feet. However, by Wednesday of this week, it was clear that the foundation in the corners of the building extended to at least six feet below the surface but most of the wall was only about four feet deep. Clearly, labeling this structure as the icehouse is becoming questionable. West wall of icehouse exposing the bottom of the foundation wall. This week we also continued excavating the drain and confirmed that there was a wooden box fitted into an excavated trench that sloped towards the cliff. We began augering by pulling up three of the oak floor boards of the icehouse floor, exposing a layer of soil approximately 0.5 feet thick (we are measuring in tenths of feet this year rather than inches) and exposed a tightly placed layer of bricks. The layer of bricks aligns exactly with the drain to the rear of the structure. After removing a few bricks, we began drilling the underlying soil but it proved extremely difficult. Initially, a relatively fine sand was exposed below the bricks. The soil appeared unconsolidated with angular and rounded pebbles and cobbles. At approximately two feet below the brick floor, the cobbles made it difficult to proceed with the auger and we quit for the day. These cobbles could represent a fill material placed in the icehouse when the function of this structure was no longer needed; or, more likely they represent the Pleistocene cobble layer that we exposed in 2012 and essentially represent the natural soil profile. That being the case, the floor of this building is only two feet below ground surface making it unlikely to be the icehouse. However, we are continuing to investigate this structure. We’ll let you know the results next week. Finally, our Kipona exhibit at the Indian Pow Wow on City Island was fun and successful. Our goal is to promote the contribution and preservation of Pennsylvania archaeology and hopefully inspire the public to visit our exhibits in the State Museum. We had almost 2000 visitors over the three day event. They were fascinated by the dugout and especially the stone tools on hand that were used to create it. They were also frequently surprised that people have been living on the island for well over 8000 years. Among the visitors was former Mayor Stephen Reed. 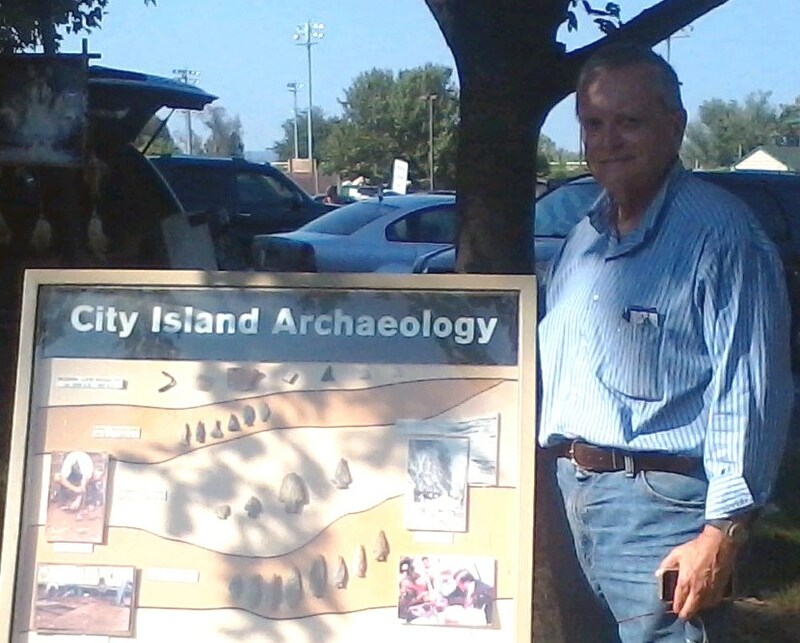 He supported our excavations on City Island between 1992 and 2004 and we greatly appreciate the City’s contribution. A special visitor to our exhibit. Also, don't forget to mark your calendar Saturday, November 14, 2015 for the Annual Workshops in Archaeology Program. This year's theme Weed Seeds to Garden Seeds: The Archaeology of Farming in the Keystone State. Check our website for more information.